We left Sydney on Wednesday 27th March in our 1979 Electra and headed straight for Melbourne arriving 10 hours later after an uneventful journey (mechanically) down the Hume (an indication of a trouble free trip to come). We spent a couple of nights with our son and daughter-in-law in Kew who took us to some nice restaurants in the area. 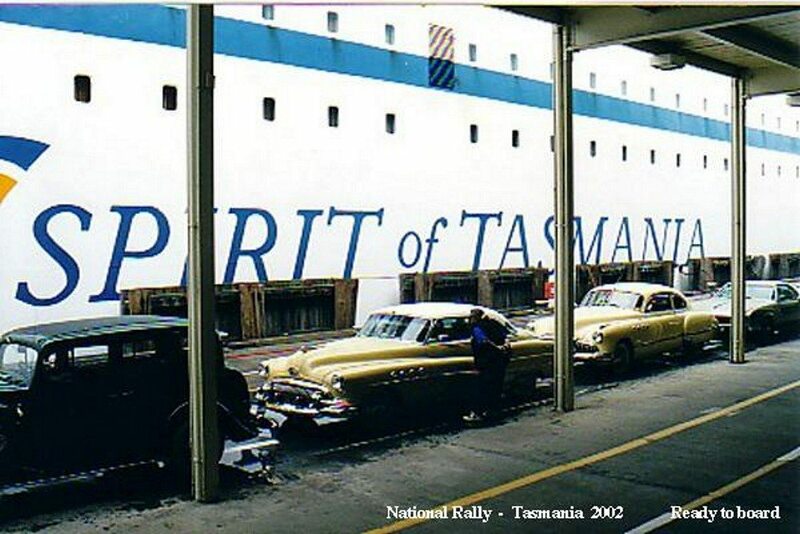 On Good Friday and with a mass of other cars, lots of them Buicks, we boarded the Spirit of Tasmania for a different type of cruising for the night. The trip over was somewhat rough, to say the ship was surfing down the face of the waves across the Straight is only a minor exaggeration of the night’s surf, oh I mean cruise! We noticed numerous people walking around the ship in blue shirts and jackets with Buick printed or embroidered on them. Some people were wearing name tags making introductions a bit easier on us since we hadn’t been on a multi state rally before and had not met any interstate Buick members. We met Adrian and Jenni from WA (one of a number who drove all the way over) who told us of a mishap near Port Augusta involving the left hand side of their car and a sleeping driver in another vehicle travelling in the same direction! 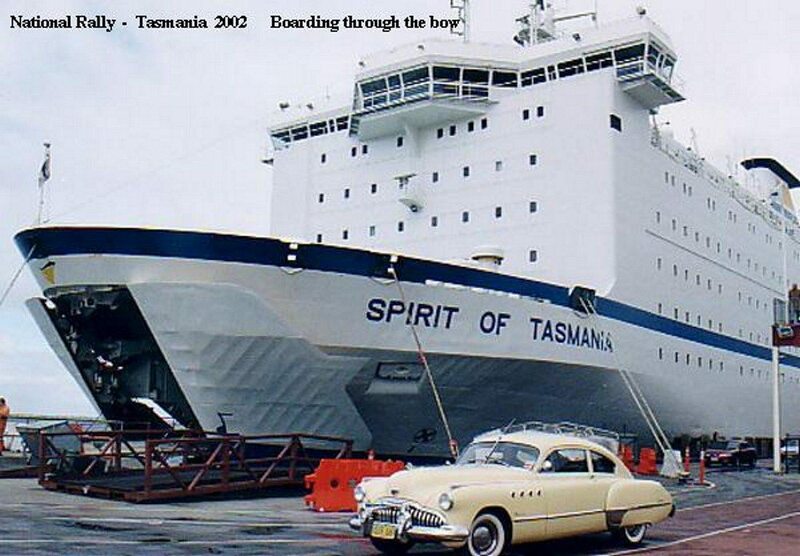 Upon docking in Devonport and once the cars were finally unloaded we were assembled in an adjacent parking area. We were held up by none other than a Buick owner who had lost his vehicle on the ship (he was paged as owner of vehicle registration “Buick1”, how ironic)! 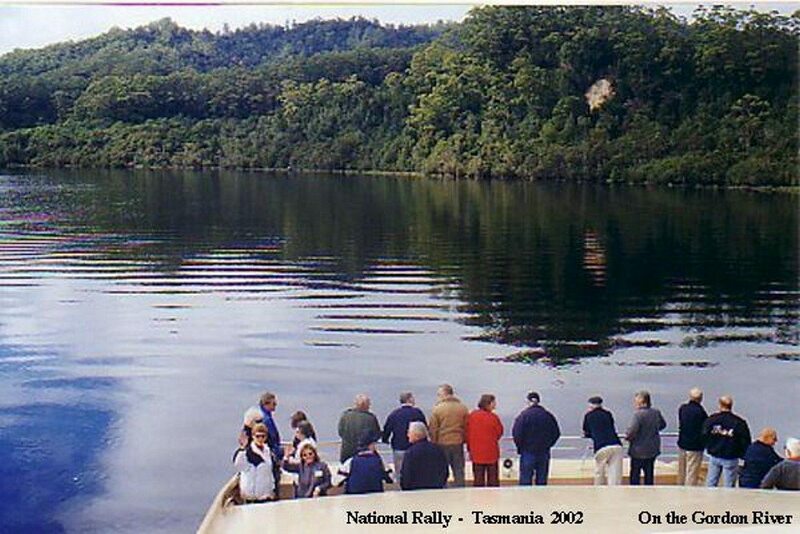 We were greeted by Victoria’s President, Bryan Flynn and Graham Barwick of Tasmania who really was the tour organiser. 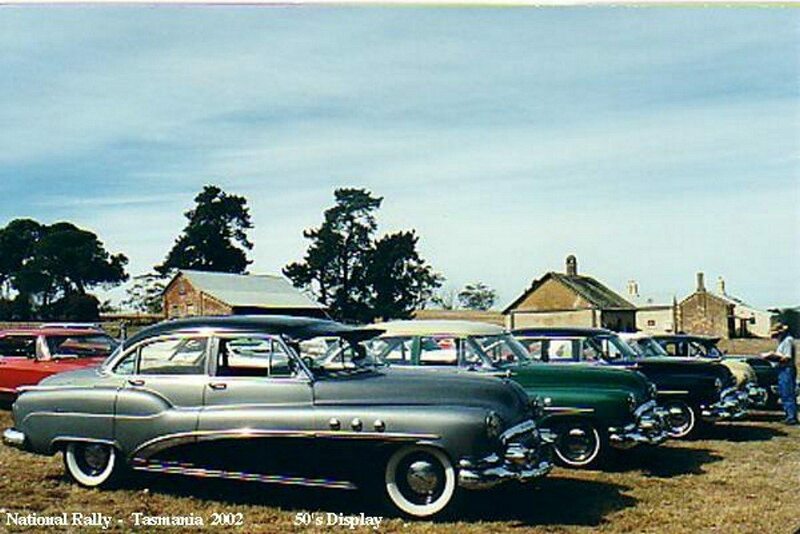 What a sight to see all those Buicks assembled ranging from the 1920’s to our ’79. 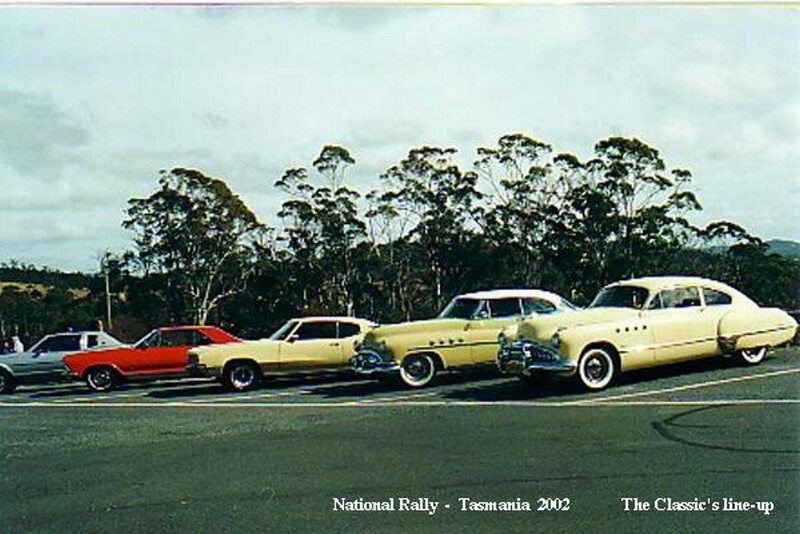 After a brief “get to know you” the cars filed off following Graham’s 1940 Buick touring through some very scenic country to check into our hotels in Launceston for the next few days and where we were welcomed by the VCCA Tasmania at their club rooms for a BBQ dinner. Sorry for Rod and Sue Dean (of Orange) that their ’51 sedan broke an axle 500 yards from the hotel. 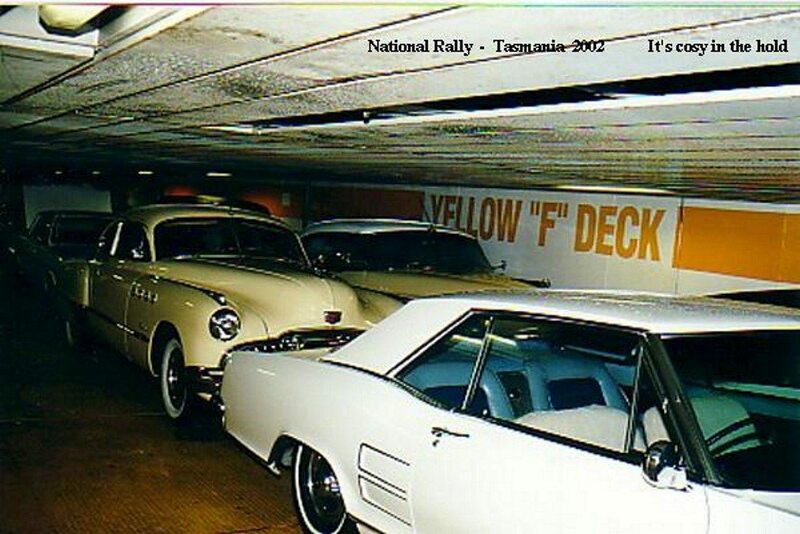 Sorry also for Brian and Yvonne Edward who’s ’39 Series 40, which was registered the day before departing Melbourne, had a squeaking noise coming from the motor. Blockage found and rectified in oil gallery in the head (nice to know for future reference for our ’39). On Easter Sunday after we had done some more sight seeing around the Launceston area, Bob and Gail (Jim?s brother and sister-in-law) joined us in Launceston for the next two weeks of the tour. This necessitated a fair bit of boot cramming with their luggage, and our luggage, their purchases and our purchases! 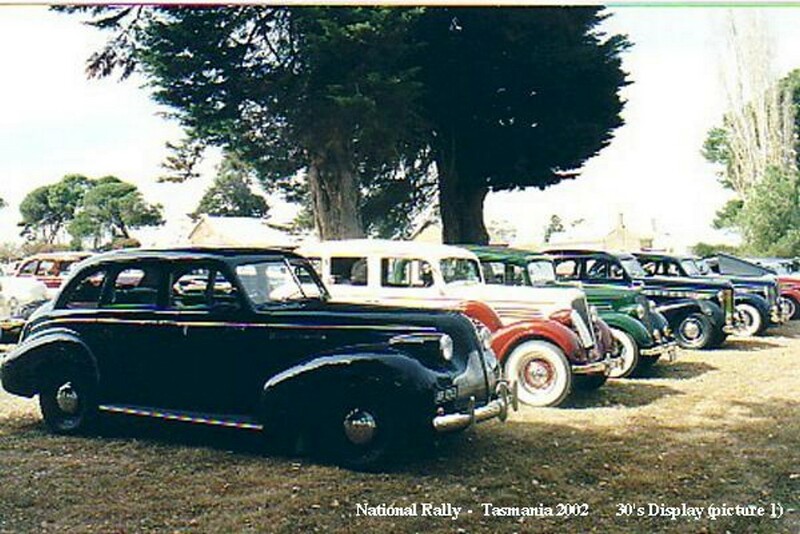 Repairs to Rod and Sue’s car were carried out in the hotel car park; also a manifold gasket was replaced on Ken and June Knight’s ’40, with the generous help of the VCCA members. 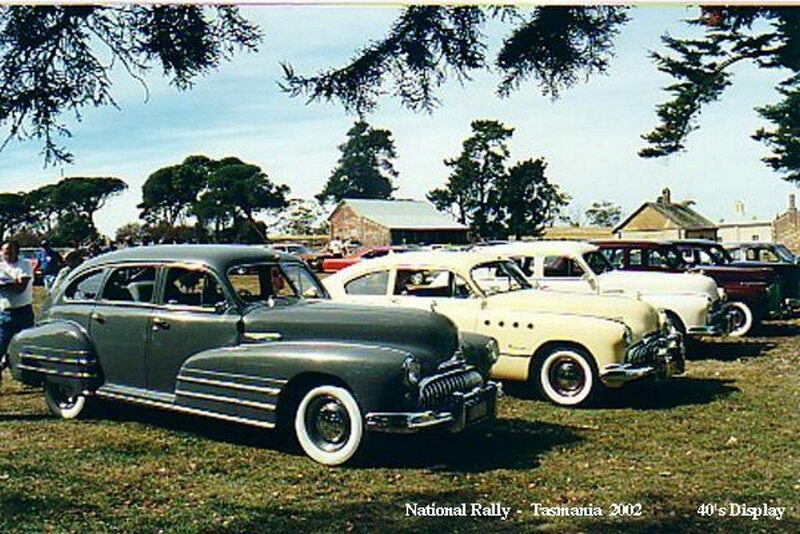 Easter Monday was the “Show and Shine” day, held at beautiful, historic Woolmers Homestead where 65 shimmering, shining Buicks of all ages (and a couple of ring ins) strutted their stuff! What a sight! 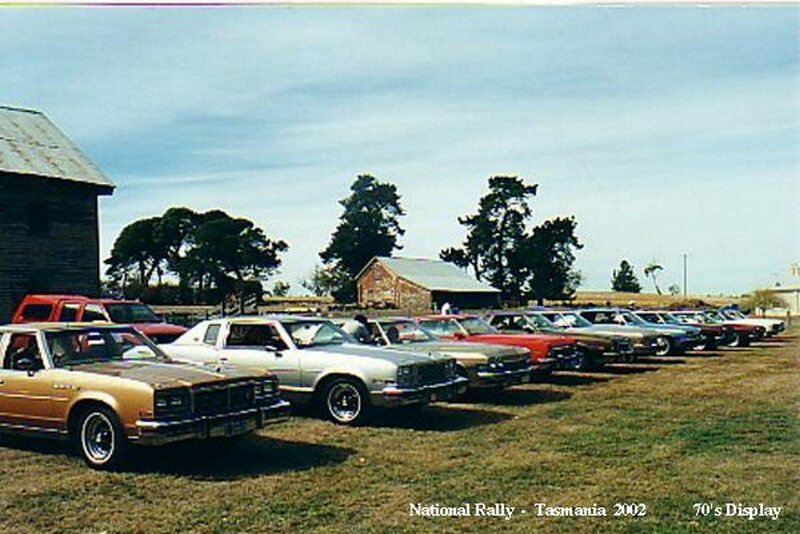 While the cars were being judged we were able to take a guided tour of the historic homestead and the National Rose Gardens of Tasmania (approximately 2000 rose plants from 270 classified names). 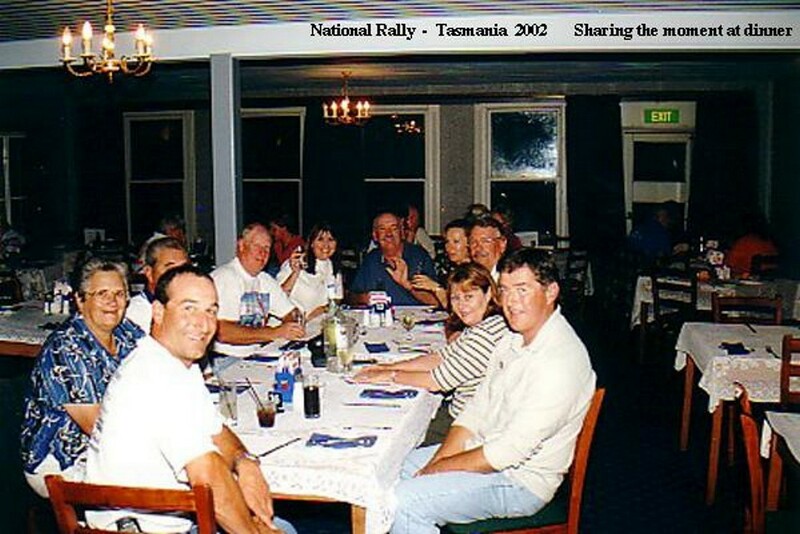 Before leaving Woolmers, a gathering of available club committee members from all states was held where Western Australia requested that the next Nationals be held in their state and this was accepted by those in attendance who agreed to report this at their next state meeting. 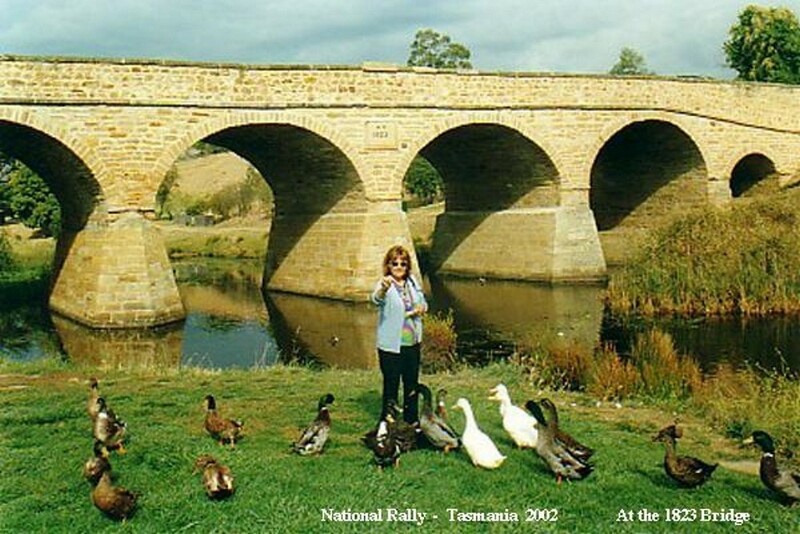 On Tuesday we left Launceston for more touring and then headed north to Devonport and farewelled those who unfortunately had to make their way back home. We hope they can spend longer at the next Nationals. 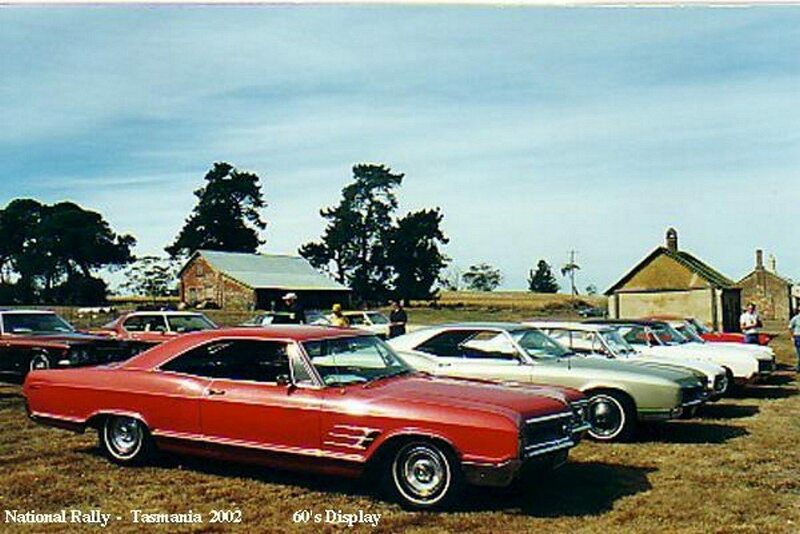 At this point the touring really started and we proceeded on to Burnie and Wynyard on the North West Coast. Here we met a sea lion at the dock next to our motel. Lucky fella was being fed by the local fisho restaurant (thankfully said the local fishermen!). 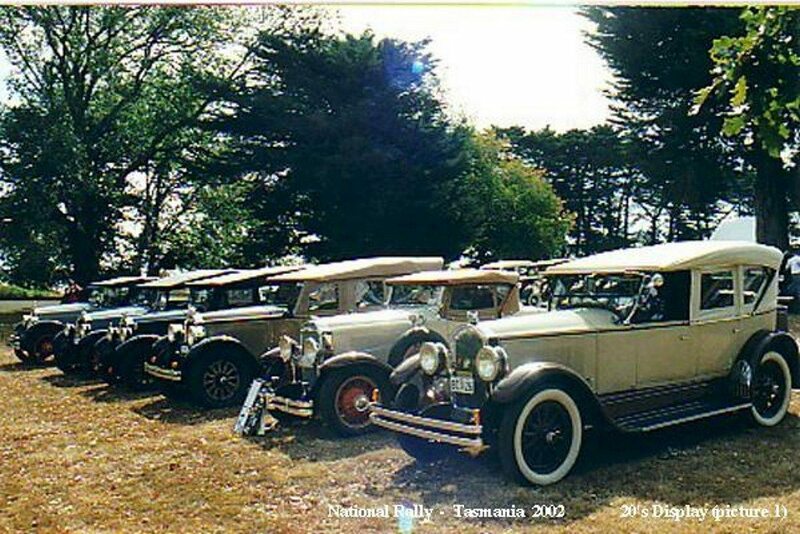 At Wynyard we met Francis Ransley; a man with one of the best collection of Veteran cars in Australia with early Fords being a speciality and several that predate the Model T. These included an A, an F, a K and an N Model. 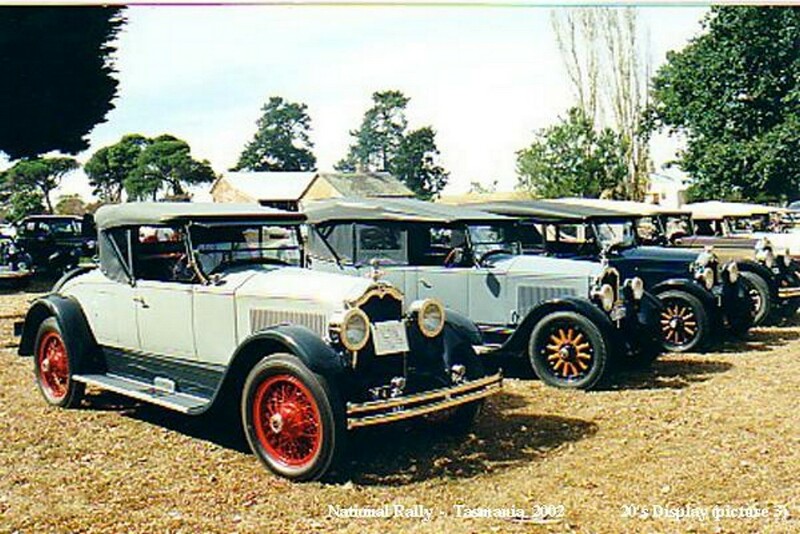 The A Model dates from 1903 (Centenary next year). We then travelled out to Stanley where Rob Breheny, one of the Victorian members, had previously discovered a pioneering ancestor’s name on a plaque on “The Nut”. Also at The Nut we found out how expensive the abundant seafood was when we ordered a Lobster salad for lunch! Some of us got very sore hands from gripping too tightly the chairlift to the top of The Nut, some others, smarter people, took the long walk up there! Next stop Queenstown where we saw snow falling on the mountain just above the township, a first for some to see! What a strangely bleak landscape where a little regrowth is starting to appear on the mountains after the riggers of tree felling and tin mining. 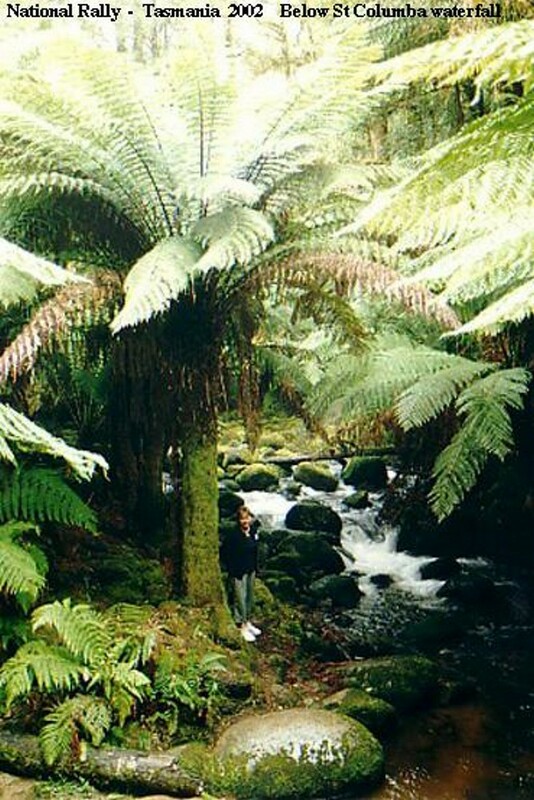 We had a cruise through Macquarie Harbour and up the mighty Gordon River. Unfortunately, Col Hinxman and Rod Davidson’s mate Bob from Queensland had a nasty turn and was spirited off to Burnie Hospital and eventually shipped home to Brisbane. Hope all is well for Bob now. After our river cruise we had an historic train ride on the restored ABT railway into the spectacular rain forest. 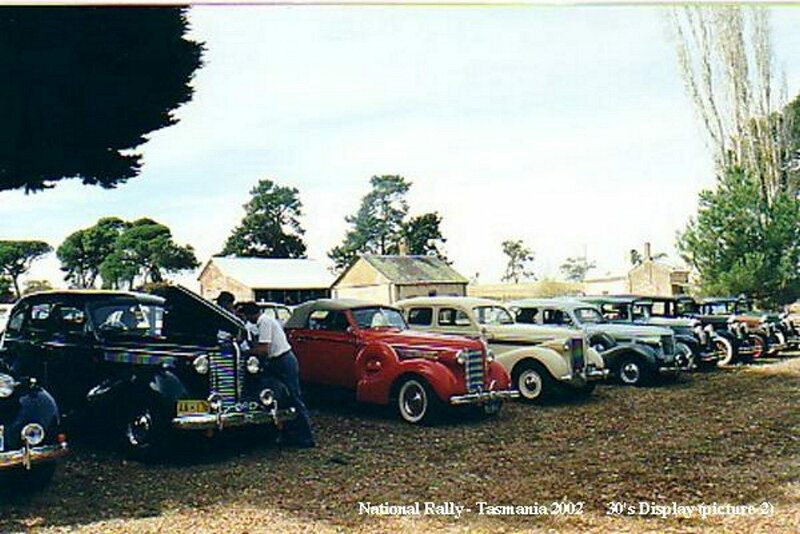 Rowly and Trish Morgan from Tamworth in their ’51 Riv. were unlucky leaving Queenstown when the rear seal on their auto transmission failed, emptying out all the fluid. Thankfully they joined us later. Hobart had us for four nights and the Russells hurried there early in the morning to visit the renowned Salamanca Markets at Constitution Dock. We had a great day buying souv’s for the family and feasted on the freshest prawns that night bought right from the water’s edge! 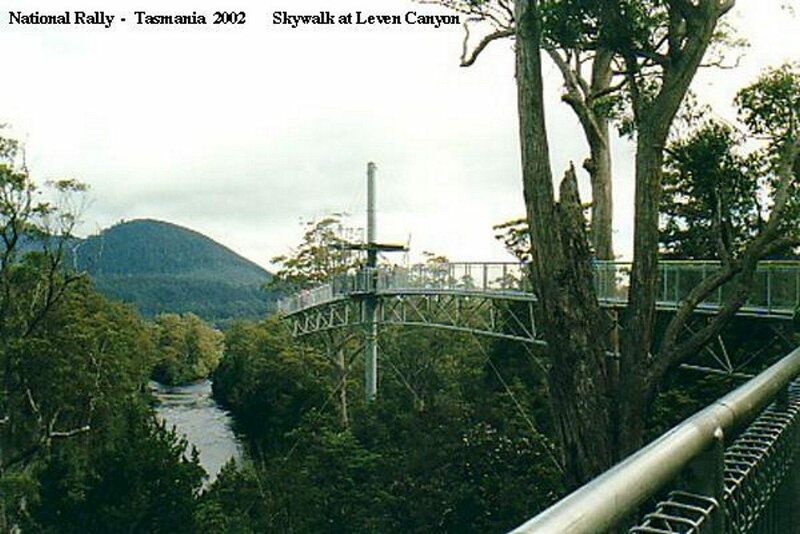 On Sunday 7th we headed south to Geeveston and on to the Tahune Forest Air Walk where most took the walk (some with white knuckles again) out through the forest canopy, approx. 50′ above ground. That night we met the Southern Region members of the VCCA at a dinner at their club house (about 20 miles out of Hobart). 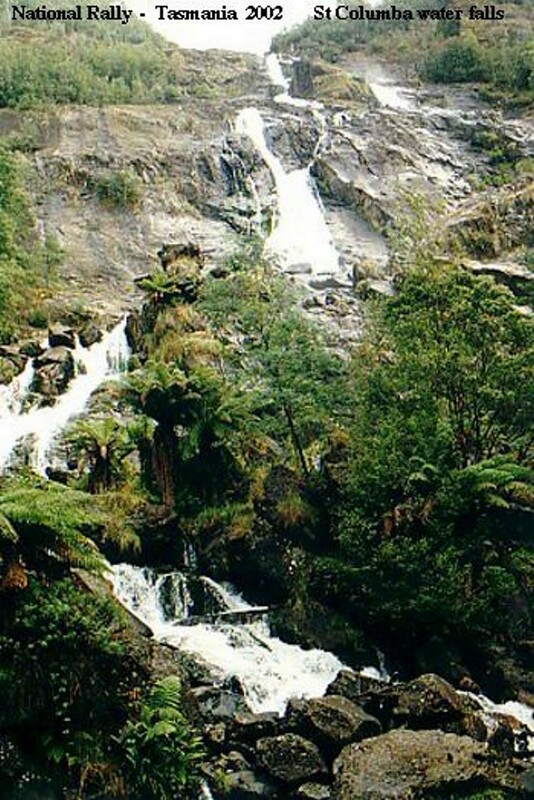 The next day the Russell’s toured around wineries and of course went to our family waterfall, Russell Falls at Mt Field National Park! We toured up Mt Wellington by coach leaving most of the cars at home (the coach had overheating problems, obviously our members had been eating too many sausages on the tour!) 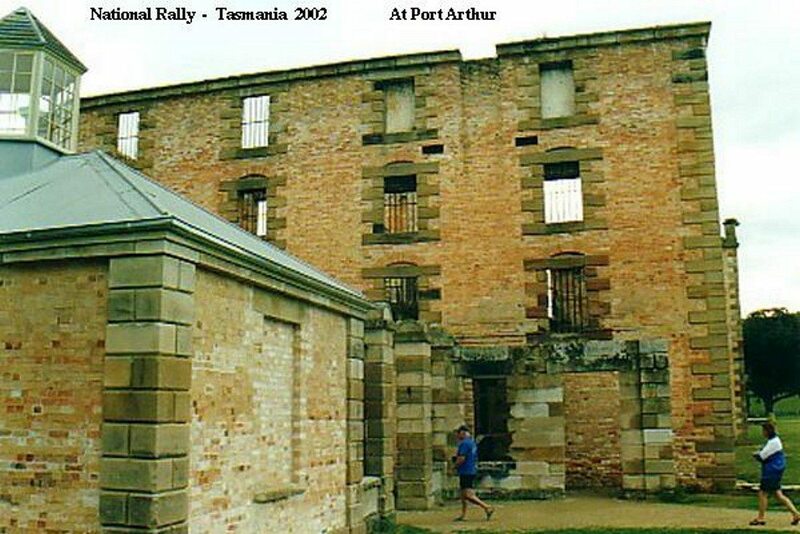 and could see all the way to Port Arthur. Of course, we also had to visit the Cadbury Chocolate Factory, a chocoholics delight! Wednesday saw us packing (cramming?) the boot again and we headed for Port Arthur over the once fallen Tasman Bridge (quite safe now!) and through beautiful and historic Richmond, fantastic pastry shop there! So much to see at Port Arthur and surrounds so some of the Russells (Jim and Virginia) took to the air in a “float plane” and some of the Russells (Gail and Bob) stayed behind to photograph the event! What a spectacular flight and worth every bit of next month’s mortgage! 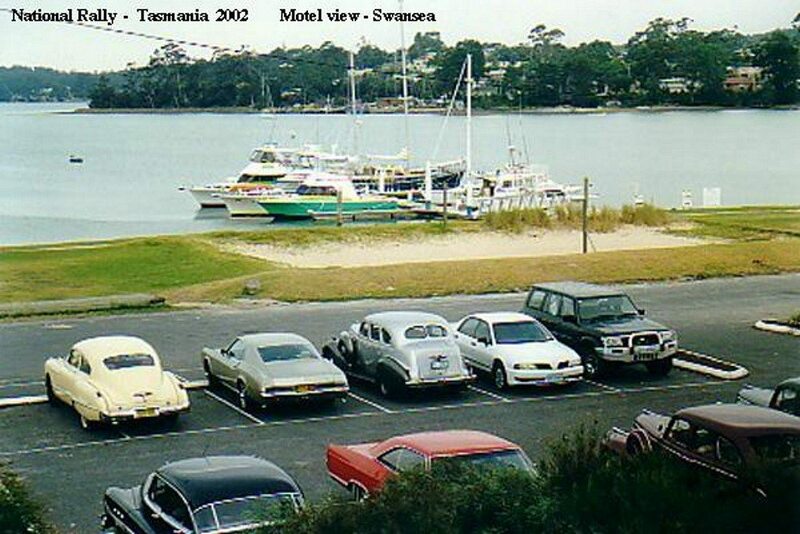 All too quickly we packed again and headed further north along the Tassie east coast via Sorrel where the local Retirement Home fed us while its residents reminisced over the cars of their youth. Our club donated some key rings for the resident’s electric “Buick” Gophers. That night was spent in Swansea which was absolutely beautiful (we could have stayed and stayed there) and the next at St Helen’s which wasn’t quite as appealing but wonderful hospitality from the local Uniting Church who fed us far, far too well. Unfortunately, Peter Pinner’s 1970 Skylark was side swiped while parked in a small town causing some minor paint damage (car was completed just prior to the tour). 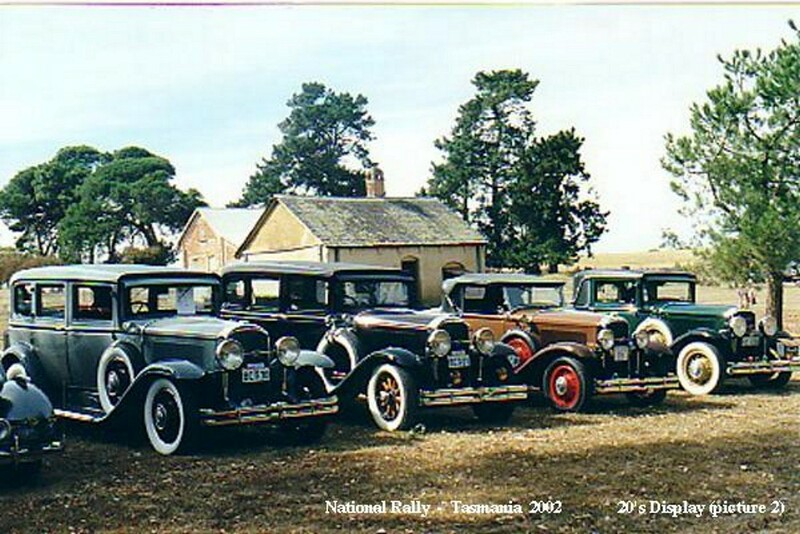 Back to Launceston where we met with some competition at the hotel for parking as the Targa Tasmania participants had arrived in time for their rally starting the following Tuesday. A fair amount of pit work was being carried out in the car park again, this time by the Targa participants. While on our way to Launceston we visited more wineries and who could go to Tassie without visiting the Lavender Farm, well Jim could but I just had to go there! Before taking off for Ulverstone we farewelled Bob and Gail as they had to fly back to Sydney for work the next day, commiserations, but someone has to work! En route to Ulverstone we passed through Sheffield, the town of murals, and for another meal of way too much fantastic, home cooked food provided by the local Bowls Club ladies of the town! We toured the hills surrounding Ulverstone, travelled on another interesting steam train at Don and finally headed off to board the Spirit of Tasmania for our journey home. Thankfully it was a smooth trip home and no reports of seasickness! The drinks, dinner and breakfast on board were a final chance to chat and farewell our newfound friends for our trips home. It’s amazing how the extra two weeks of travelling together allows great friendships to develop. 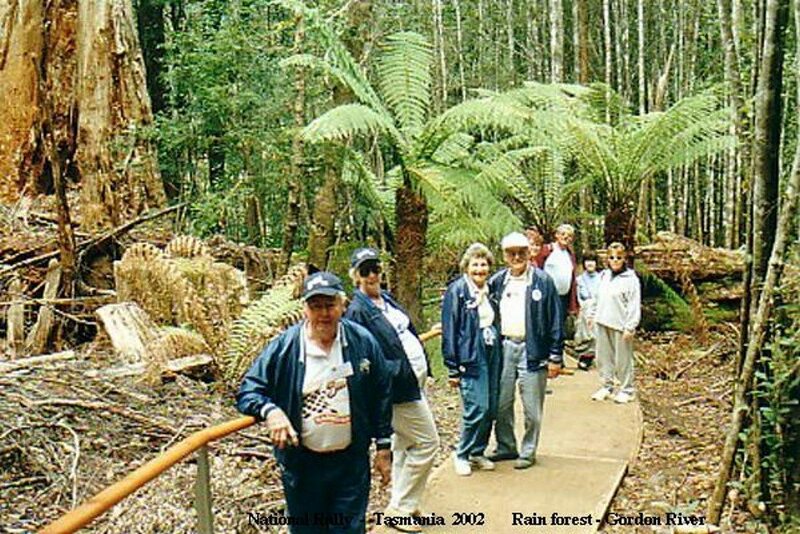 We look forward to meeting all and more in Western Australia sometime in 2004! Our car didn’t let us down at all on the trip, and in fact exceeded all expectations using only 2 litres of oil (won’t mention the petrol tanker we towed around)! We hope everyone managed to get home safely and without mishap. 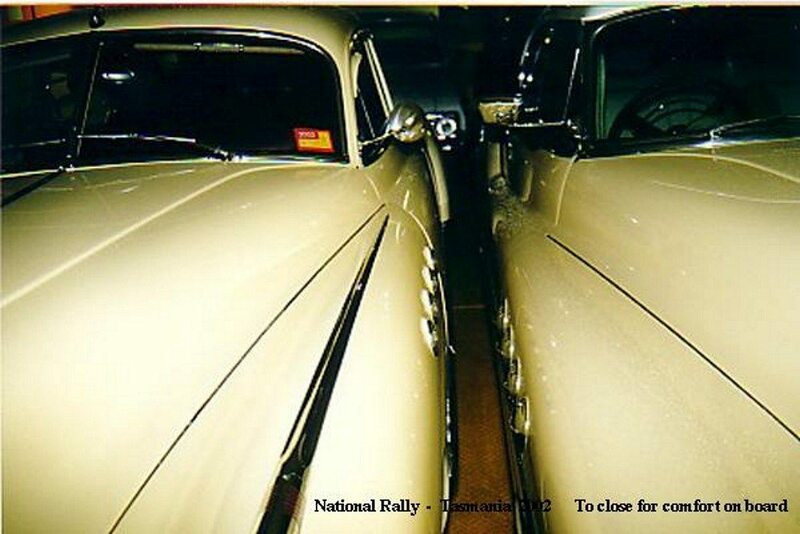 Also, Rod Dean, could you come to one of our meetings and give us a demo on car polishing, you’re such an expert! Our thanks to the Victorian club for opting for a tour of the little island and for all the hard work by the Vic club and Graham Barwick. It was a wonderful tour, wonderful food and absolutely wonderful hospitality! Thank you very much.